The United States Coast Guard (USCG) has recently published its Annual Port State Control (PSC) Report and Annual Class Performance List for 2016. Basis the published performance results for the year 2016 and the 3-year period 2014-2016 relevant to Class societies, INSB Class remains in the top performing group of class societies with a detention ratio of 0%. 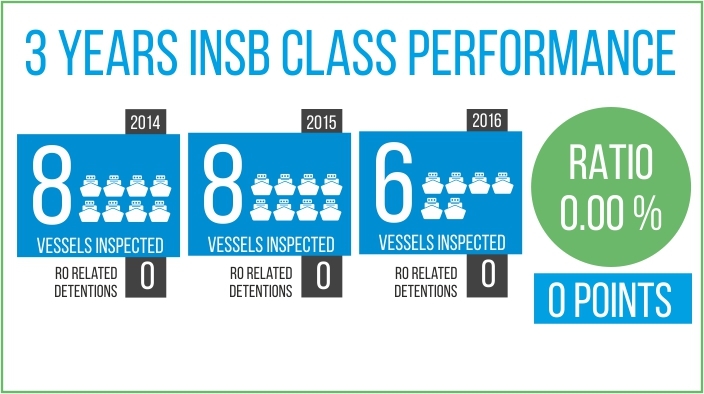 In 22 individual vessel examinations received in the period 2014 to 2016 (distinct arrivals), INSB Class was not attributed with any RO related detention and thus continues its unbroken presence amongst the top performers in the USCG Port State Control Reports, since 2013.